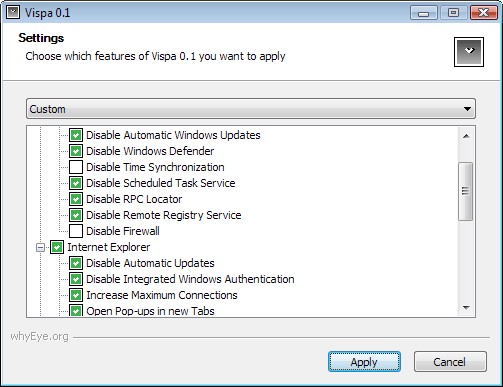 Vispa is an open-source software that easily allows its user to tweak Windows Vista to disable all communication with Microsoft servers, increasing privacy and security, aswell as improving the general performance. ...... Do a few clicks rather than finding the write registry keys or program settings. Just a couple of minor cosmetics lead to these new versions, probably the last before the next major version. I'm currently overthinking the strategy of running two seperate builds, xpy and Vispa. Qweas is providing links to Vispa 0.6.2 as a courtesy, and makes no representations regarding Vispa or any other applications or any information related thereto. Any questions, complaints or claims regarding this application Vispa 0.6.2 must be directed to the appropriate software vendor. You may click the publisher link of Vispa on the top of this page to get more details about the vendor.